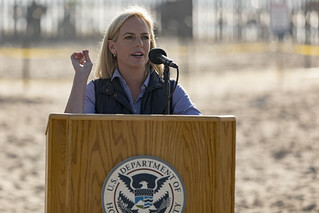 Secretary of Homeland Security Kirstjen M. Nielsen holds a press conference at Border Field State Park near Imperial Beach, California, to provide an update on the ongoing border security efforts and the caravan. She is accompanied by U.S. Customs and Border Protection's Pete Flores, San Diego Director of Field Operations; Hunter Davis, Director of Air and Marine Operations in San Diego; and Rodney Scott, Chief Patrol Agent of the U.S. Border Patrol San Diego Sector. November 20, 2018.